I'm "needs to be twisted to keep working". The obvious solution is to have only a single USB cable. Then, it will be the good one. Most of mine fall out the phone too easily (Wileyfox Swift, the port is recessed just a little too much). And the one that stays in the phone securely falls out at the other end, because it's one of those silly "stylish" USB-A's that doesn't have the outer bit. Forgot to tag myself: I'm "too short". not to mention leaving out the various "mini" but not "micro" connectors that were briefly in vogue? My problem, as you might have guessed, is not finding a USB cable with the right far-end connector for some ancient piece of gear. Last edited by Soupspoon on Wed Sep 20, 2017 6:37 pm UTC, edited 1 time in total. One of the primary reasons I despise Apple is the hideously low-grade accessories they supply with their expensive "state of the art" devices. The cable-fray situation in particular has shown no improvement since the Iphone 3G and yet I recall they charge over $20 for a replacement. No thanks, the 5$ knock-off charger might burn my house down, but just the cable supplied with it is actually worth that sort of money. 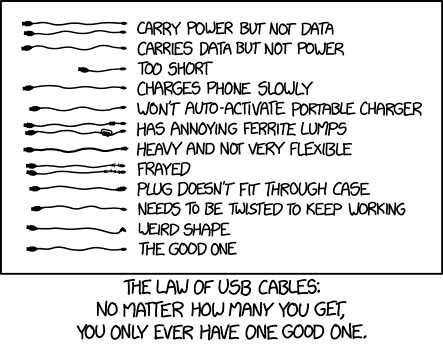 Speaking of that, this comic is missing the Proprietary cable you will inevitably lose. HES wrote: Most of mine fall out the phone too easily (Wileyfox Swift, the port is recessed just a little too much). And the one that stays in the phone securely falls out at the other end, because it's one of those silly "stylish" USB-A's that doesn't have the outer bit. One of the most embarrassing incidents of my recent professional career was when I spent an hour or so trying to identify the connector that had come with some bit of kit. It was supposed to be USB, but they'd obviously supplied the wrong thing, or there had been two cables in the box originally and the USB one was missing. Turns out yes, it was one of those. somitomi wrote: Speaking of that, this comic is missing the Proprietary cable you will inevitably lose. That one has already been lost. I carry power but not data. I have gotten from my cables what I wanted. Granted, that isn't everyday use. That makes me an outlaw, then. This pretty accurately describes our house too - somewhere around 10-15 different cables lying around a couple of "charging station" places in our house. Somewhere between 0 and 2 at a given station actually work (depending in part on the device you are trying to use with it). We don't care about data cables because bluetooth/wifi for wireless connections with the computer. I'm "Carries Data but not power" which is really obnoxious because he's really heavy and I don't have the right connectors to charge him. There are a few Mini-B USB-connected devices left in the house, but most of the cables have slowly desintegrated or have a <200mA adapter on one end, so it's always a fight for which device gets to live. Well, it's not that bad, since most of them go on for weeks after recharging, but my beaglebone needs a constant supply (with or without a data connection) to survive. Last edited by cryptoengineer on Wed Sep 20, 2017 9:32 pm UTC, edited 1 time in total. I'm sorry Dave, I'm frayed I can't do that. I carry data but no power, I charge slowly and won't auto-activate, I have annoying lumps and a weird shape because I'm heavy and not very flexible, I'm extremely frayed from trying to overcome all of the above, which I guess is why I need to be twisted to keep working. I read this comic at work (compiling). Then I thought about which one I am. Then I noticed that I was stretching my shoulder without thinking about it before fixing the next test failure. Observation demonstrates that I'm "Needs to be twisted to keep working." I have a USB charger lead for my old PSP (Playstation Portable) that is the only one that can fit my specific PSP, it charges via a fairly standard looking circular DC port, but the contacts in the port have moved a bit, and the plastic insulator in the plug is recessed when it should stick out from the end about 1mm, so the pairing works, but I can't use the mains charger as that has an undamaged plug. My phone only charges if the cord is bent up. My tablet only charges if the cord is bent down, and then sometimes it claims to be charging, and shows charging on the battery history graph, but turns out not to have been actually charging. Very annoying. I also have a Palm sync/charge cable, but I no longer know where the Palm is. My phone only charges when the AC prongs are jiggled just right. (They used to fold, now they flop). My Palm only charges when... well... when it feels like it. Yes, it indicates it's charging, but it can be "charging" all day and not take a charge. But then sometimes it does. I've tried taking it apart, unplugging the battery and plugging it back in; sometimes that works (it seems more like a religious ritual to me). But lately even that sacrament has no effect. But sometimes it just charges the normal way. And yes, I still use a Palm; maybe this belongs in the Obsolete Tech thread. Power without data is helpful when charging at work (some places check for plugged in USB devices and complain when you do) or when charging off an unknown source (eg a friend's PC that could be virus ridden, or a USB charging port at an airport that could be set up to do something nasty to your phone). Heavy and not very flexible. I need to get down to the gym more often. ucim wrote: My phone only charges when the AC prongs are jiggled just right. (They used to fold, now they flop). Connected to an MS-DOS PC, presumably? Don't worry, it's still probably as good as anything. Calendar synchronisation remains one of the hardest problems in computer science; synchronising recurring appointments is generally believed to be impossible. There are whole journals devoted to the Third Thursday Problem. At least they're all USB cables. Come 2019, my compatriots and I can look forward to returning to the days when we had drawers full of incompatible power adapters and data cables. Yay Brexit. I can't relate to this. 90% of My USB cables are Good Ones. Even if they fall in the other categories, they are still good for some purpose. The short one is just perfect for attaching the external hdd that resides right behind my laptop. And the only frayed one I have is that of my headset, but it still works, and of course it's not a USB connector cable in the strict sense. orthogon wrote: Come 2019, my compatriots and I can look forward to returning to the days when we had drawers full of incompatible power adapters and data cables. Yay Brexit. Oh come on, we EUians always have to use power adapters when visiting your island. USB OTOH is not an EU standard. herbstschweigen wrote: USB OTOH is not an EU standard. Micro USB as the standardised phone charger, is. It's USB C now. Unless you are an Apple. The last phone (dumbphone) that I bought, to replace one lost (dropped, not stolen, though apparently still used by someone else before I actually got the replacement's SIM attached to the old number) I was asked if I had the charger for it already. I had chargers for several old phones, including one of that brand (earlier model) but was confused over what to answer because they were all different standards, so which (old/new/revamped) standard of connector was this? Sorry, I meant power supplies/chargers rather than mains adapters. On the latter issue, the EU has been trying to standardise mains power plugs and sockets too, but of course that's a lot more difficult because of the billions of Euros of installed infrastructure and the decades-long churn times for fixed wiring. There are also other issues, particularly relating to fusing and cable ratings, that mean that it's even more than "just" replacing all the sockets. Anyway, as HES identified, my main point was that the standardisation on USB is one of many, many excellent answers to the question "what did the EU ever do for us?". ETA: @Soupspoon: despite the change to USB-C, existing chargers will still work, it's just that you need a different cable. So the amount of electrical waste and the inconvenience of needing multiple chargers is reduced. The device might not charge as fast, though. I'm "carries data but not power". Oh, I wasn't aware of this. But do they still use proprietary chargers in other places of the world? Or has it become a de-facto worldwide standard now? BTW I don't understand the "plug don't fit through case" one. What case? And as I forgot it, I'm "too short". Sometimes also "carry data but not power." Another missing one: "Works on one of two identical devices, but not the other." commodorejohn wrote: Another missing one: "Works on one of two identical devices, but not the other." That's clearly because you have two Fermionic devices. If they were Bos[e]ons, you'd be all set. herbstschweigen wrote: BTW I don't understand the "plug don't fit through case" one. What case? This would be when you have a hard (or soft) case around your phone, and the hole in the case left for the charge cable is not large enough to let the connector fully plug into the phone. I've found this is the case for some of my older cords which have a beefier plastic part around the actual micro USB connector. Flumble wrote: I believe it's a 'thing people do' nowadays when presenting lists of things: ask others with which of the entries they identify most. And like most "things people do" nowadays, it almost immediately devolved into self-parody in a way that's not immediately obvious to outsiders and has led to people doing it way more often than when they were serious, because people who think it's funny also think it's funny enough to do 24/7. See also: spirit animals, posting "A E S T H E T I C" or "T H I C C" in response to pretty much everything, deep fried memes, etc. Re: 1892: "Why is everyone misspelling 'thick' and what do they mean by it???" Yeah I own half or so of these. Including multiple 'need to wiggle and hold for it to work' cables, a couple held together by tape in different ways, and a bonus 'still in the packet for when the good one dies'.